The first traces of life appear nearly 3.5 billion years ago, in the early Archaean. However, clearly identifiable fossils remain rare until the late Archaean, when stromatolites, layered mounds produced by the growth of microbial mats, become common in the rock record. Stromatolite diversity continued to increase through most of the Proterozoic. Until about 1 billion years ago, they flourished in shallow waters throughout the world. Their importance for understanding Proterozoic life is tremendous; stromatolites that have been silicified (forming a type of rock known as stromatolitic chert) often preserve exquisite microfossils of the microbes that made them. Shown here is a sample of stromatolitic chert from the Bitter Springs Formation of central Australia, about 850 million years old. Note the typical fine banding patterns. Stromatolites began to decline in abundance and diversity about 700 million years ago. A popular theory for their decline (though certainly not the only possible explanation) is that herbivorous eukaryotes, perhaps including the first animals, evolved at about this time and began feeding extensively on growing stromatolites. 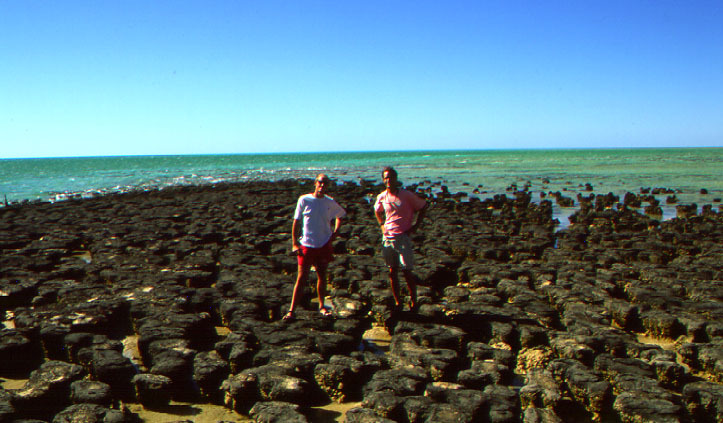 Stromatolites are rare fossils after about 450 million years ago. Today, they are found only in restricted habitats with low levels of grazing, such as the shallow, saline waters of Shark Bay, Australia. The oldest fossil that may represent a macroscopic organism is about 2.1 billion years old. Several types of fossil that appear to represent simple multicellular forms of life are found by the end of the Paleoproterozoic. These fossils, known as carbon films, are just that: small, dark compressions, most resembling circles, ribbons, or leaves; they are most common and widespread in the Neoproterozoic (Hofmann, 1994). Some resemble seaweeds and may represent eukaryotic algae; we know from independent evidence that red algae and green algae appeared in the Proterozoic, probably over 1 billion years ago. There are tantalizing hints from trace fossils and molecular biology that animals may have appeared as much as 1 billion years ago. However, the oldest relatively non-controversial, well-studied animal fossils appear in the last hundred million years of the Proterozoic, just before the Cambrian radiation of taxa. The time from 600-650 million years ago to 543 million years ago, known as the Vendian period, saw the origin and first diversification of soft-bodied organisms known collectively as the "Vendian fauna" or "Ediacara fauna" (after the Ediacara Hills of southern Australia, where the first abundant and diverse fossils of this kind were found). Read about the Precambrian Mass Extinctions at the Hooper Virtual Paleontology Museum. Find out more about the Precambrian paleontology and geology of North America at the Paleontology Portal. Hofmann, H.J. 1994. Proterozoic carbonaceous compressions ("metaphytes" and "worms"). Pp. 342-357. In: Bengtson, S. (ed.) Early Life on Earth. Columbia University Press, New York.